Balls are items (but they have their own pocket in the bag) that you can catch Pokémon with. They are very vital to the game, because you will need it to catch Pokémon for your journey. It starts with Poké Ball, to Master Balls, which are very rare and will always catch any Pokémon. 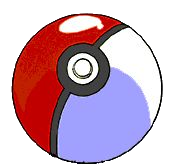 Your first ball will be when you go back to Elm's Lab, (after seeing your rival) where his lowest assistant will walk over to you (like he did when you got a potion from him) and give you a Poké Ball. Once you receive the last gym battle (beating Clair and getting the badge in the cave), Professor Elm will call you over the PokéGear and tell you he has something for you. Fly over to his lab to receive a Master Ball. Fast Ball Works well if the Pokémon can flee. List of Pokémon who flee: Abra, Natu, Magnemite, Grimer, Tangela, Mr. Mime, Eevee, Porygon, Dratini, Dragonair, Entei, Suicune and Raikou. Between 200-300kg: +20 to catch rate. This page was last edited on 1 August 2016, at 03:30. This page has been accessed 72,196 times.